From the beginning of class, I knew my final project would revolve around getting into my senior classrooms (Grades 6-8) to teach them about digital citizenship. Using what I learned in ECI831 and ECI832, I put together a presentation that broke Ribble’s 9 elements of digital citizenship in 5 strands: Content, Copyright/Copyleft, Netiquette, Identity and Activism. The strands were meant to start the discussions that teachers could then carry on while doing in-class teaching while using digital technology. I had planned for a 90 minute presentation to cover the strands, but found out I needed in fact over 2 hours to complete it. So, most classes only received the first 90 minutes which covered Content and Copyright/Copyleft. I was quite happy with this because those are the two biggest areas that most teachers are not comfortable teaching themselves. I was quite happy that the teachers also came away with new tools and understanding for using content online. During the presentations, I had teachers record parts of my teachings. Below, you will find a summary I created that puts together what parts of my presentation looked like in the classroom. I also chose to do a Screen Cast-o-matic review of each of the 3 Apps/Websites that I use to enhance reading and the use of technology in the library. EPIC! is an app and website that offers free online books to students through their teacher. 2. Bookopolis.com is a website that allows students to write reviews about books they have read. 3. Aurasma is an augemented reality app that I use to create book reviews in the library. The third part of my project was redefining the role of the Teacher-Librarian as Information Specialist. The above rubric currently displays the role of the Teacher-Librarian as an Information Specialist in Regina Public Schools. 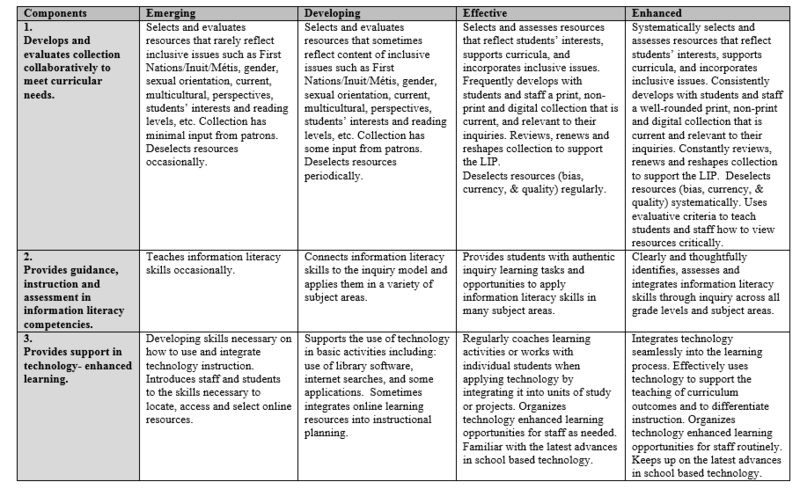 In my opinion, this rubric doesn’t encompass the new roles that the Teacher-Librarians have. First, we need to define the new roles of the Teacher-Librarian as an Information Specialist. Emerging: Rarely collaborates with teachers, or only with those at a certain grade level grouping, to review informational resources that are available. Developing: Occasionally collaborates with teachers and administration to review informational resources that are available. Effective: Collaborates with teachers, students and administration to identify the needs of informational resources to meet curricular and social topics. Enhanced: Collaborates with teachers, students and administration to “identify links across student information needs, curricular content, learning outcomes, and a wide variety of print, nonprint and electronic information resources”. Emerging: Rarely acquires resources that are related to curricular outcomes and ongoing social/inclusive topics. Rarely critically evaluates current collection to deselect resources that are no longer valid sources of information. Developing: Sometimes acquires resources that are related to curricular outcomes, ongoing social/inclusive topics. Periodically critically evaluates current collection to deselect resources that are no longer valid sources of information. Effective: Acquires and critically evaluates all resources that are acquired and part of the current collection and deselects resources that no longer support curricular outcomes of social/inclusive topics. Supports the use of all formats of informative resources that help support curricular outcomes and ongoing social/inclusive topics. Enhanced: Acquires and critically evaluates all resources that are acquired and part of the current collection with the teaching staff, students and administration to ensure the needs of all are met. Along with staff, students and administration, deselect resources that no longer support curricular outcomes of social/inclusive topics which allows the critical evaluation process to be understood by teachers, students and administration. Encourages and demonstrates the use of all formats of informative resources. Educate teachers, students and administration with regards to the ethical and critical views of the informational content and aspects of using both print and digital medias. Emerging: Rarely discusses any topic related to digital media and digital citizenship but is very current on copyright laws. Developing: Occasionally addresses with teachers the importance digital content and critical evaluation of the content. Discusses some aspects of digital citizenship. Effective: Openly invites and discusses current views and trends that support informational content in both digital and print form. Works collaboratively with teachers to address issues of digital citizenship. Enhanced: Actively engages and collaborates with teachers, students and administration to keep the discussions open surrounding print and digital content and actively participating in a positive manner online by incorporating digital citizenship into all lessons. Be a technology Leader within the school with regards to technology integration, technology use, and technology etiquette. Emerging: Often shows teachers and students how to access certain digital content online, where to get the technology and how to maintain the technology. Developing: Supports technology integration into lessons and research with teachers and students. Effective: Works directly with teachers, students and administration to effectively integrate technology into everyday learnings. Fosters an open environment to allow for digital creativity. Familiarizes him/herself with all the latest advances in the school’s technology to provide training to teachers, students and administration on its usages. Continues to provide ongoing training about technology etiquette. Enhanced: Collaborates with teachers, students and administration to provide the fullest curricular experience with technology integration. Provides students, teachers and administration with opportunities to express themselves using digital medias. Models and informs teachers, students and administration with proper technology usage and etiquette. This entry was posted in ECI832, ECI832 Final Project and tagged Digital Citizenship, digital media, teacher-librarians by rochellerugg. Bookmark the permalink.